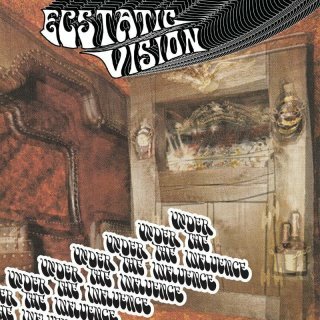 ECSTATIC VISION unleash UNDER THE INFLUENCE, a collection of six RAW, FUZZY, PSYCHEDELIC slabs of COSMIC ROCK. UNDER THE INFLUENCE sees the band covering tracks by some of their biggest influencers; The primitive stoner doom sounds that came out of ZAMBIA in the early/mid 70s that is known as ZAM ROCK, the godfathers of space-rock HAWKWIND, and the early kings of Detroit rock n' Roll THE MC5, all delivered with ECSTATIC VISION's signature bone crushing, blown-out in-all-the-right-ways recording style. ECSTATIC VISION introduced their brand of heavy primal psych influenced by groups like Hawkwind, Aphrodites Child, Olatunji, Can and early Amon Duul ll in late 2013. Formed in Philadelphia to primarily "play what they wanted to hear," the band quickly rose to those in the know as a force to be reckoned with.